In a wooded area of East Hampton, midway up a winding dirt drive, nestled amid ferns, tall grasses, and scrub brush sits the low, hermetic studio of Hiroyuki Hamada. While this area of town is quite densely populated, it always compels me to imagine the place a half millennium ago: an isolated, impenetrable wilderness. A reminder of this past, the building is a quiet, white presence with no entrance immediately visible. It does not invite but prods at curiosity to seek entry and discover what goes on inside a building that is clearly not a home. The clean geometric lines of the structure are counterpoint to the wild vegetation and at once contradict a chaotic disarray of objects and debris, including a child’s car seat, strewn on the path to the entrance of the studio. There is always some order in chaos: inside, works in progress are perched on saw horses alongside finished pieces that rest on pedestals and platforms or hang on the walls; tools and materials are stowed on shelves, in crates or drawers, or piled on various surfaces. A fluorescent grid dangles from the vaulted ceiling and washes everything with a cold light. The few narrow windows that line the northeast wall are curtained, while others have blinds. A darkened area at the far end has makeshift desks with computer equipment, and a sofa; an electric guitar, amplifiers, and other music gear are propped nearby. Aside from the sofa and some chairs that are variously occupied with belongings, the only place to sit is an upholstered seat for two taken from an automobile and settled impermanently, off-center in the workspace. We stand near there talking, then wandering through the space, exploring the works and the materials that compose them. Hiroyuki Hamada creates sensuous, curved forms, constructing the shapes from foam and wood then covering them in resin or plaster. These forms are supports that he paints with pigments, enamel, oil, tar, and wax, evoking distressed, burnt, rusted, and disrupted surfaces, often crossed by lines and creases, or pocked with marks and indentations. These elements might evolve in a regular rhythm; at times he enhances the edges of the resin sheets he lays, creating an irregular texture. Lines might appear like grooves on the surface when they are, in fact, painted in relief. These works trick the eye continually. They are at once sculpture and painting. They might appear to be ceramic, or to have parts in metal or wood. The manner in which Hamada builds and treats surfaces brings out characteristics that fool and fascinate. Several pieces for his upcoming exhibition at Lori Bookstein Fine Art in New York are in the studio, finished or close to it. Hamada likes to keep pieces around—for several years in some cases—moving them around, viewing them from alternate angles, at different times of day, living with them for a while. For the Bookstein show that opens on Oct. 10, he is preparing 10 large three-dimensional works, plus a couple of small paintings on paper and several digital prints. The prints are a successful and intriguing new endeavor. They derive from pencil drawings that he digitizes then works on in Photoshop, shading, enhancing, adding or diminishing contrast, in essence drawing over drawing. The resulting rich textures and nuances are not unlike the three-dimensional pieces. Whereas non-representational work devoted to formal elements can sometimes be devoid of emotion, these pieces connect with the viewer at a sensuous level. The artist’s hand is apparent: constructing, layering, sanding, and painting, he leaves the surface somewhat imperfect, although from afar the works might seem pristine. While the compositional materials are synthetic and appear rigid, the shapes appear organic and biomorphic and are free-form. They might recall the architecture (and art) of Le Corbusier. My conversation with Hiroyuki Hamada reveals the role of consciousness in his work. Awareness of self, of what is within, of one’s surroundings, including others, is paramount. Reverence is a term he uses, referring to the importance of having a deeper appreciation for all things. This is clearly not limited to spirituality or environment; it involves society and politics, history and current events. Hamada’s work demands more than a glance. It requires close observation, for it is not about surface appearances, in a world that is dominated by them. While devoid of symbolism or narrative, the work is expressive through the harmony and balance of contrasting parts. Smooth and polished surfaces coexist with rough, corroded ones; exactingly rendered lines and shapes coincide with ragged indentations; precisely engineered outlines are complemented by expressionist brushwork. So is the world composed of chaos and order, decadence and renewal, cruelty and compassion, flaws and perfection. We seek equilibrium. Art can direct us toward that haven; Hamada’s certainly does. 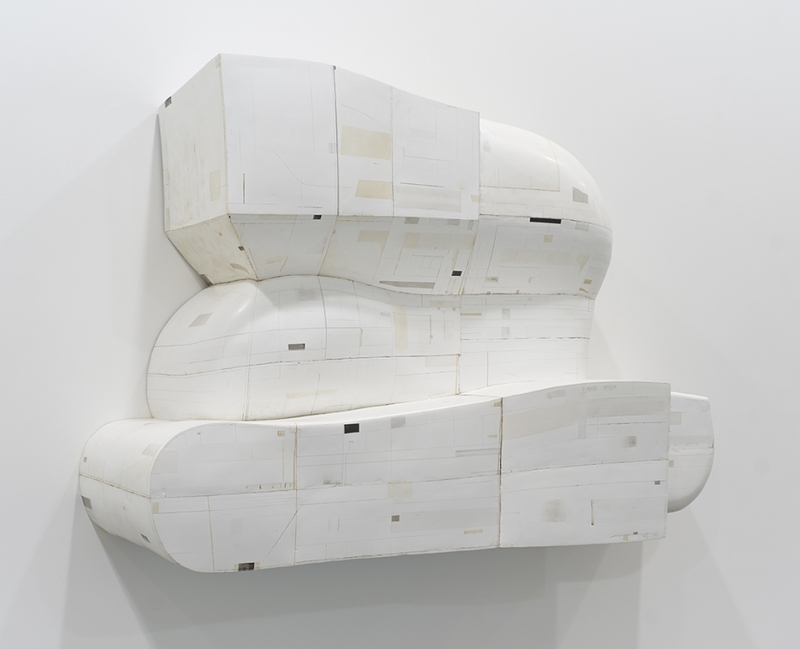 BASIC FACTS: “Hiroyuki Hamada” opens on Oct. 10 at Lori Bookstein Fine Art in New York City. An Opening Reception will be held on Oct. 10 from 6 to 8 p.m. The solo show featuring recent works continues through Nov. 9, 2013. This is Hamada’s second solo show at the gallery. A few of the works in the exhibition can be viewed online at www.loribooksteinfineart.com. Lori Bookstein Fine Art is located at 138 Tenth Avenue, New York, NY 10011. (Between 18th and 19th Streets). The gallery is open Tuesdays to Saturdays from 10:30 a.m. to 6 p.m. www.loribooksteinfineart.com. Hiroyuki Hamada is based in East Hampton, NY. www.hiroyukihamada.com.